Develop a Systems Mindset and discover how everything is interconnected. Systems thinking helps you gain a different perspective of how the world works and overcome reductionist thinking. This foundation course will help you wrap your head around the systems at play and give you the tools you need to understand the complex social, industrial & environmental systems and how they interact. It's a must for anyone wanting to start or build their capacity in understanding systems dynamics, relationships and how to create systems change. Receive the foundations of systems thinking methods, habits, and practices. Understand systems dynamics, especially in terms of feedback loops and systems archetypes. Develop the ability to identify, explore, and map system relationships for interventions, while leveraging flexible and divergent thinking practices. Easily define boundaries and scope; identify archetypes, nodes and feedback loops and employ a variety of systems mapping techniques. In this knowledge session, we’ll unpack the theory and framework of Systems Thinking, providing tools for mapping systems and ways to explore and synthesize the world around us from a systems perspective. You will learn the methods and approaches needed to understand system dynamics, identify and map relationships and connections, and better understand feedback loops. You’ll discover how everything is interconnected and learn how to identify the three major systems at play in the world around us. Finally, you’ll explore why easy solutions can often lead to negative impacts elsewhere, and why the easy way out often leads back in. You’ll replace this mainstream reductionist thinking with the framework to actively think and solve in systems. 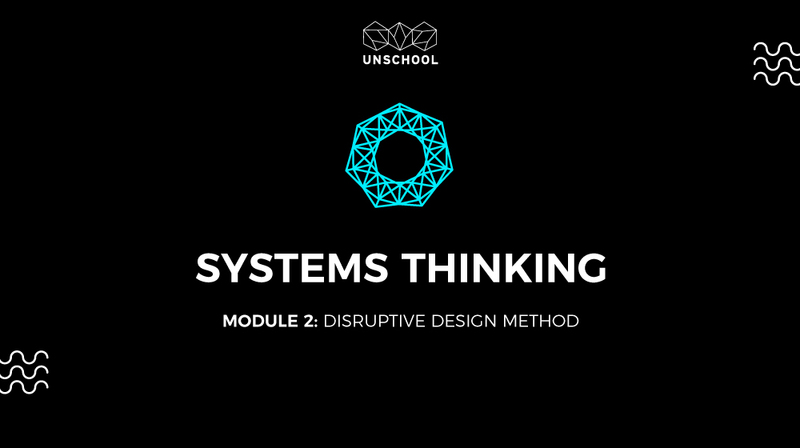 As a core part of the Disruptive Design Methodology, this exploration of the Systems Thinking practice lays the foundation for designing systems interventions that affect positive social change. It also helps you develop the foundations of a three-dimensional thinking framework that will feed into any work you do! Let’s dive in! Part 1: What is Systems Thinking? Video: What is Systems Thinking?